Some Halloween treats are trickier than others when it comes to sugar and calories. Here's a better way to dip into your kids' candy stash. Fall is here — and with the cooler weather comes bag after bag of Halloween candy on display at your local drugstore. Walking down all of those aisles stuffed with sweet, spooky treats sure makes it tempting to pick up a few. While Halloween candy wouldn’t be classified as a health food, that doesn’t mean you can’t enjoy any without feeling guilt afterward. “My philosophy is that you can have these things in moderation,” says Amy Gorin, RDN, owner of Amy Gorin Nutrition in Jersey City, New Jersey. There are a few strategies you can use to keep yourself in check. “One thing that I like to suggest is to only buy Halloween candy the week of — or maybe even the day before — Halloween so that it’s not sitting around your house and you’re not inclined to eat it before trick-or-treaters come over,” says Natalie Rizzo, RD, New York city-based registered dietitian. When you do head to the store for Halloween candy, pick up ones that come in bite-size, individually wrapped packaging, says Gorin — and see if you can limit yourself to one or two. Take a long time to chew on a piece of candy so that you really savor the flavor and feel satisfied after just a little bit, suggests Gorin. A study found that people ate about two more pieces of candy when it was placed in clear bowls near their desks versus in opaque containers further away from them. Another tip: Store your Halloween candy on a top shelf in a sealed container so it’s out of sight, says Samantha Cassetty, RD. “That way when you’re reaching for it, you’re doing so with purpose and mindfulness,” she says. A study published in the International Journal of Obesity found that people ate about two more pieces of candy when it was placed in clear bowls near their desks versus when candy was stored in opaque containers further away from them. But what if you do down a whole bag of candy corn or peanut butter cups in one sitting? “Obviously, it’s a hard time of year — if you’re at an office, there’s probably a candy bowl, and if your kids are trick or treating, it’s hard to say, ‘I’m not going to touch it,’” says Gorin. "If you have more than planned, just start over right away. Say, 'OK, I ate too much candy, and right now I’m going to stop.'" Are office snacks making you fat? This is why. A single peanut butter cup has 110 calories and 11 grams of sugar. Despite the sugar content, it’s still a top choice given that it’s individually wrapped and does have some protein (two grams) and fiber (one gram), says Gorin. “The protein and fiber will help keep you fuller longer,” she says. Although this lollipop with gum in the center has 13 grams of sugar, it’s only 70 calories. The low calorie count and the fact that sucking on one will occupy you for a while make this choice another acceptable treat. “It takes a while to eat, so you’re satisfying that craving for sweet over a period of time,” says Rizzo. Of course, the Halloween candy options are practically endless. Here are how some of the other popular picks fare. Like Reese’s Peanut Butter Cups, a four-piece serving of Snickers Minatiatures does offer you some protein (three grams) and fiber (one gram), which can help keep you full. But one serving has 170 calories and 18 grams of sugar. Gorin likes this candy if you only eat one, which knocks your sugar intake down to less than five grams. “I like chocolate candies more, especially if they come in small packages,” says Rizzo. These tiny Kit Kats clock in at 170 calories and 17 grams of sugar for four pieces. Again, our experts recommend limiting yourself to one piece to stay under five grams of sugar. Rizzo notes that while some chocolate candies may have more sugar than Twizzlers, they’re at least giving you a little fiber and protein. But at 120 calories and 16 grams of sugar for three pieces, Twizzlers aren’t a terrible choice if you eat less than the serving size. Cassetty suggests limiting yourself to one Twizzler (so that you stay at about five grams of sugar) and taking your time eating it. “One Twizzler seems like a decent way to get a sweet fix,” she says. Gorin adds that because it can be difficult to stop at one, focus on taking small bites and enjoying the experience. “Tootsie Rolls are chewy, so you can take your time to enjoy them,” says Cassetty. Four mini Tootsie rolls have 150 calories and 19 grams of sugar but no protein or fiber. As our experts have advised for the other candies on our list, cut down the serving size and stick to one piece to limit your sugar intake. One mini Tootsie Roll has less than five grams of sugar. Ah, candy corn — you’ve sadly earned the lowest score of all Halloween candies. 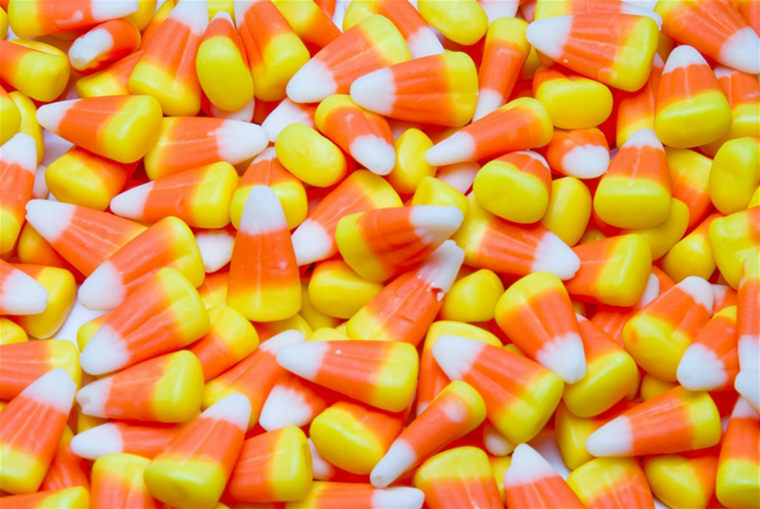 A serving size of candy corn — 19 pieces—is 140 calories and 28 grams of sugar. Since candy corn comes in a bag (and not in smaller portions), this one doesn’t get very high marks. “If you have three pieces, it’s not so bad, but most people don’t do that,” says Rizzo. We Went Without Added Sugar for 10 Days. Here's What Happened. Classic Halloween candies aren’t your only choice if you have a hankering for something sweet. Consider satiating your craving with individually wrapped 1-ounce pieces of dark chocolate, which have health benefits that super-sugary, relatively nutrient-free Halloween candy doesn’t, says Gorin. (For example, according to a study published in the Journal of Cardiovascular Pharmacology, dark chocolate contains antioxidants —known as flavanols — that could protect your heart.) Rizzo is a fan of Kind minis, which clock in at only 100 calories and have varieties made with dark chocolate, along with more nutritional value than candy. The BETTER newsletter helps you make the most of your mind, body and your life — sign up now! What is healthier: natural sugar, table sugar or artificial sweeteners?